684 Through his grace, the Holy Spirit is the first to awaken faith in us and to communicate to us the new life, which is to "know the Father and the one whom he has sent, Jesus Christ." 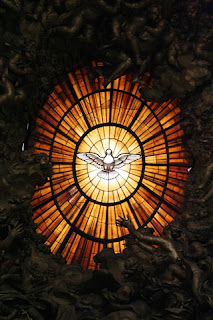 1989 The first work of the grace of the Holy Spirit is conversion, effecting justification in accordance with Jesus' proclamation at the beginning of the Gospel: "Repent, for the kingdom of heaven is at hand." 1999 The grace of Christ is the gratuitous gift that God makes to us of his own life, infused by the Holy Spirit into our soul to heal it of sin and to sanctify it. 2003 Grace is first and foremost the gift of the Spirit who justifies and sanctifies us. 2010 Since the initiative belongs to God in the order of grace, no one can merit the initial grace of forgiveness and justification, at the beginning of conversion. 161 Believing in Jesus Christ and in the One who sent him for our salvation is necessary for obtaining that salvation. "Since 'without faith it is impossible to please [God]' and to attain to the fellowship of his sons, therefore without faith no one has ever attained justification, nor will anyone obtain eternal life 'But he who endures to the end.'" 1816 Service of and witness to the faith are necessary for salvation: "So every one who acknowledges me before men, I also will acknowledge before my Father who is in heaven; but whoever denies me before men, I also will deny before my Father who is in heaven" (Mt 10:32-33). 153 Faith is a grace. When St. Peter confessed that Jesus is the Christ, the Son of the living God, Jesus declared to him that this revelation did not come "from flesh and blood", but from "my Father who is in heaven". Faith is a gift of God, a supernatural virtue infused by him. "Before this faith can be exercised, man must have the grace of God to move and assist him; he must have the interior helps of the Holy Spirit, who moves the heart and converts it to God, who opens the eyes of the mind and 'makes it easy for all to accept and believe the truth.'" 1966 The New Law is the grace of the Holy Spirit given to the faithful through faith in Christ. This fact that Catholics believe in salvation by grace through faith is the first and most important thing to establish before any discussion on salvation can be undertaken. If you, as a Catholic, begin by discussing the importance of the sacraments, or of good works, or merit, or indulgences, or anything else, then you will simply be talking past your opponent. After all, he probably enters the discussion already thinking that Catholics are Pelagian and so will filter any talk of sacraments, or works, or merit through that misunderstanding. But, once you lay the groundwork by affirming what he himself believes, then you can begin to show how sacraments and everything else fits within that belief in the primacy of grace and faith. Catholic "Initial Justification" and Protestant "Faith Alone": Significant Common Ground? However, in the Book of Acts, we see that the apostles were baptizing people “in the name of Jesus Christ” (2:38; 10:48) and “in the name of the Lord Jesus” (8:16; 19:5). Are the apostles being disobedient? No. It makes more sense to say that Luke is simply differentiating the Christian baptism from the other baptisms of the day, such as John's baptism (cf. Acts 1:5,22; 10:37; 11:16; 13:24; 18:25; 19:4), Jewish ritual washings (Gk "baptizo"; cf. Mk 7:4; Lk 11:38), and the baptism for the dead (cf. 1 Cor 15:29). We also can’t forget that, according to Matthew’s gospel, the command to baptize in the name of the Trinity was Jesus’ final word to His apostles before He ascended into heaven. They are a sort of last will and testament to them. This means that those words are very important, and you can bet the apostles hung on every last word of it. To think that they would then go forth and baptize in some other way is nonsensical. “The Lord himself told his disciples that they should baptize all peoples in the name of the Father and of the Son and of the Holy Spirit . . . for indeed, legitimate baptism is had only in the name of the Trinity"
By baptizing as Jesus’ commanded, the Church is simply doing what Christians have always done. 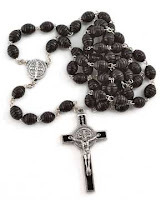 Is the Rosary "Vain Repitition"? Some anti-Catholics are fond of using Mt 6:7 against the practice of praying the rosary. But, does that passage really apply? Mt 6:1-8 "Beware of practicing your piety before men in order to be seen by them; for then you will have no reward from your Father who is in heaven. 2 "Thus, when you give alms, sound no trumpet before you, as the hypocrites do in the synagogues and in the streets, that they may be praised by men. Truly, I say to you, they have received their reward. 3 But when you give alms, do not let your left hand know what your right hand is doing, 4 so that your alms may be in secret; and your Father who sees in secret will reward you. 5 "And when you pray, you must not be like the hypocrites; for they love to stand and pray in the synagogues and at the street corners, that they may be seen by men. Truly, I say to you, they have received their reward. 6 But when you pray, go into your room and shut the door and pray to your Father who is in secret; and your Father who sees in secret will reward you. 7 "And in praying do not heap up empty phrases as the Gentiles do; for they think that they will be heard for their many words. 8 Do not be like them, for your Father knows what you need before you ask him. Protestants may be more familiar with the KJV rendering of vs. 7: "But when ye pray, use not vain repetitions, as the heathen do: for they think that they shall be heard for their much speaking." At any rate, the context is crucial here. What this reveals is that Jesus was not condemning repetition as such, but vain repetition, that is, saying words over and over so that you can be seen and heard by men and receive their praise. Jesus is speaking against those people who pray, not out of humility and adoration of God, but so that they can be known for their so-called piety. Catholics don’t pray the rosary with that intention, thus this passage does not apply. Mt 26:39,42,44 And going a little farther he fell on his face and prayed, "My Father, if it be possible, let this cup pass from me; nevertheless, not as I will, but as thou wilt." [...] 42 Again, for the second time, he went away and prayed, "My Father, if this cannot pass unless I drink it, thy will be done." [...] 44 So, leaving them again, he went away and prayed for the third time, saying the same words. Ever read the Psalms? They are filled with repetitive prayer. Psalm 136 repeats the phrase “his steadfast love endures forever” 26 times! Worship in heaven is also repetitious: “day and night they never cease to sing, ‘Holy, holy, holy, is the Lord God Almighty, who was and is and is to come!’” (Rev 4.8). It's clear from this that, when it comes to praying, the intentions of the heart are what matter most. What are some examples of sins against the Holy Spirit? The primary sin against the Holy Spirit is the act of disbelief of the Spirit's divinity and His working in Christ and through the Church. This can also take the form of despair over one's soul, in which a person considers oneself beyond the saving power of the Holy Spirit. When Jesus comes again, heaven and earth will pass away. He will usher in a new heaven and a new earth, in which all evil, and sin, and suffering, and weakness, and temptation, and hunger, and every ill-effect of sin and the devil on earth will be definitively destroyed. On that day, heaven and earth will come together to be one place of perfect peace and happiness where Jesus reigns forever and ever (cf. Rev 21:1-5). By saying that His words will outlast even the entire created order as we know it, He is emphasizing the permanent relevance and power and timelessness of His word. I've heard that Jesus could've been as old as a toddler or possibly even older when the three wise men came. Does the Church have an age range established? The Church usually does not define incidental matters of history like this. So, there is no authoritative teaching on the matter. When and why did the Orthodox churches branch away? Why is Catholicism broken up? Why wouldn't the pope unite them? Well, it isn't that Catholicism is broken up, it's that several groups of Christians have separated themselves from Her over the years. There had been many years of theological disputes and hurt feelings between Christians in Western and Eastern Europe leading up to 1054 AD, when representatives from both sides excommunicated each other. This was the "straw that broke the camel's back", so to speak, and was the impetus for many churches in the East to form what would be known as the Eastern Orthodox Church. However, since the Eastern Orthodox Church maintains a valid apostolic succession and all seven sacraments, there are still many ties that bind us. Especially since the Second Vatican Council, the Popes of the Catholic Church and the Patriarchs of the East have made every effort at reunification. I think there is good reason to believe that one day we will be one Body again. Having recently defended the divinity of Jesus and the creative work of the Father, it seems only fitting that I would spend some time on the Holy Spirit. Specifically, I am striving here to defend the divinity and unique personality of the Spirit. This has probably been the most difficult of the three to write, but I think that a convincing case has been made. "With the Father and Son, He is worshiped and glorified." I hope I have done Him justice. 2 Cor 13:14 The grace of the Lord Jesus Christ and the love of God and the fellowship of the Holy Spirit be with you all. That three Persons would share a single name -- and two of them are most certainly divine -- strongly implies coequality among Father, Son and Holy Spirit. The passage from 2 Cor is much like it. Jn 14:17, 23 (cf. 1 Cor 3:16; 6:19) even the Spirit of truth, whom the world cannot receive, because it neither sees him nor knows him; you know him, for HE DWELLS WITH YOU, and will be in you. [...] 23 Jesus answered him, "If a man loves me, he will keep my word, and my Father will love him, and we will come to him and MAKE OUR HOME WITH HIM. 1 Cor 3:16 Do you not know that you are God's temple and that God's Spirit DWELLS IN YOU? Acts 5:3-4 But Peter said, "Anani'as, why has Satan filled your heart to lie TO THE HOLY SPIRIT and to keep back part of the proceeds of the land? 4 While it remained unsold, did it not remain your own? And after it was sold, was it not at your disposal? How is it that you have contrived this deed in your heart? You have not lied to men but TO GOD." Acts 7:51 (cf. Exo 16:8; Psa 78:17) "You stiff-necked people, uncircumcised in heart and ears, you always resist THE HOLY SPIRIT. As your fathers did, so do you. Exo 16:8 And Moses said, "When the LORD gives you in the evening flesh to eat and in the morning bread to the full, because the LORD has heard your murmurings which you murmur against him--what are we? Your murmurings are not against us but against THE LORD." Psa 78:17 Yet they sinned still more against him, rebelling against THE MOST HIGH in the desert. Acts 28:25-26 (cf. Isa 6:3,8-10) So, as they disagreed among themselves, they departed, after Paul had made one statement: "The Holy Spirit was right in saying to your fathers through Isaiah the prophet: 26 Go to this people, and say, You shall indeed hear but never understand, and you shall indeed see but never perceive. Isa 6:3,8-10 And one called to another and said: "Holy, holy, holy is the LORD of hosts; the whole earth is full of his glory." [...] 8 And I heard the voice of the Lord saying, "Whom shall I send, and who will go for us?" Then I said, "Here am I! Send me." 9 And he said, "Go, and say to this people: 'Hear and hear, but do not understand; see and see, but do not perceive.' 10 Make the heart of this people fat, and their ears heavy, and shut their eyes; lest they see with their eyes, and hear with their ears, and understand with their hearts, and turn and be healed." In Isaiah, it is the LORD of hosts who tells Isaiah to say to the people that they will hear but not understand and see but not perceive. However, in Acts we see that it was THE SPIRIT who said this to Isaiah. 1 Cor 6:11 (cf. Ezek 37:28) And such were some of you. But you were washed, you were sanctified, you were justified in the name of the Lord Jesus Christ and in the Spirit of our God. Ezek 37:28 Then the nations will know that I the LORD sanctify Israel, when my sanctuary is in the midst of them for evermore." 1 Cor 12:4-6 Now there are varieties of gifts, but the same Spirit; 5 and there are varieties of service, but the same Lord; 6 and there are varieties of working, but it is the same God who inspires them all in every one. 2 Cor 3:6,17-18b who has made us competent to be ministers of a new covenant, not in a written code but in the Spirit; for the written code kills, but the Spirit gives life. [...] 17 Now the Lord is the Spirit, and where the Spirit of the Lord is, there is freedom. [...] 18b for this comes from the Lord who is the Spirit. "The Lord IS the Spirit" That is a clear affirmation of His divinity. Heb 3:7-9 (cf. Exo 17:7) Therefore, as the Holy Spirit says, "Today, when you hear his voice, 8 do not harden your hearts as in the rebellion, on the day of testing in the wilderness, 9 where your fathers put me to the test and saw my works for forty years. Exo 17:7 And he called the name of the place Massah and Mer'ibah, because of the faultfinding of the children of Israel, and because they put the LORD to the proof by saying, "Is the LORD among us or not?" Heb 10:15-17 And the Holy Spirit also bears witness to us; for after saying, 16 "This is the covenant that I will make with them after those days, says the Lord: I will put my laws on their hearts, and write them on their minds," 17 then he adds, "I will remember their sins and their misdeeds no more." Jer 31:33-34 But this is the covenant which I will make with the house of Israel after those days, says the LORD: I will put my law within them, and I will write it upon their hearts; and I will be their God, and they shall be my people. 34 And no longer shall each man teach his neighbor and each his brother, saying, 'Know the LORD,' for they shall all know me, from the least of them to the greatest, says the LORD; for I will forgive their iniquity, and I will remember their sin no more." In Jeremiah, THE LORD said he would write the new covenant on their hearts and remeber their sin no more. But, in Hebrews, it is the Holy Spirit who said this. 2 Pet 1:21 because no prophecy ever came by the impulse of man, but men moved by the Holy Spirit spoke from God. How can a movement, an inspiration by the Holy Spirit be considered from God if the Holy Spirit is not God? Some may say, "Well, the Holy Spirit is the force, or power, or inspiration from the Father to men." But this does not give the Holy Spirit enough credit. The Spirit is more than an invisible power, He is a Person, the Third Person of the Blessed Trinity. Jn 14:17 even the Spirit of truth, whom the world cannot receive, because it neither sees HIM nor knows HIM; you know HIM, for HE dwells with you, and will be in you. Jn 14:26 But the Counselor, the Holy Spirit, whom the Father will send in my name, HE will teach you all things, and bring to your remembrance all that I have said to you. Jn 16:13-14 When the Spirit of truth comes, HE will guide you into all the truth; for HE will not speak on HIS own authority, but whatever HE hears HE will speak, and HE will declare to you the things that are to come. 14 HE will glorify me, for HE will take what is mine and declare it to you. Rom 8:26 Likewise the Spirit helps us in our weakness; for we do not know how to pray as we ought, but the Spirit HIMSELF intercedes for us with sighs too deep for words. 1 Cor 12:11 All these are inspired by one and the same Spirit, who apportions to each one individually as HE wills. The fact that "the Spirit HIMSELF" is said to do things shows that the Spirit is operating out of his own identity and personhood, instead of the Father simply using the Spirit as I would use a pencil. The Spirit is not a mere instrument of the Father, He is HIMSELF the cause of His actions. The Holy Spirit does things that only God can do for the simple fact that HE IS GOD. This is very important. The last thing we want to do is blaspheme the Spirit, which is an "eternal sin" that "will not be forgiven" (cf. Mt 12:31-32; Mk 3:29). In my previous post, I defended the divinity of Christ against a "Christian" who didn't believe that Jesus was God. Well, there is another member who believes that the Nicene Creed is wrong when it says that the Father created all things because, to him, the Son created all things -- NOT the Father. This too required me to defend something that I had always just taken for granted. I mean, isn't it a no-brainer that the Father created all things? I thought all Christians believed that, but apparently I'm wrong. At any rate, here is what I was able to find from Scripture that attributes the act of creation to the Father. Acts 17:24-31 The God who made the world and everything in it, being Lord of heaven and earth, does not live in shrines made by man, 25 nor is he served by human hands, as though he needed anything, since he himself gives to all men life and breath and everything. 26 And he made from one every nation of men to live on all the face of the earth, having determined allotted periods and the boundaries of their habitation, 27 that they should seek God, in the hope that they might feel after him and find him. Yet he is not far from each one of us, 28 for 'In him we live and move and have our being'; as even some of your poets have said, 'For we are indeed his offspring.' 29 Being then God's offspring, we ought not to think that the Deity is like gold, or silver, or stone, a representation by the art and imagination of man. 30 The times of ignorance God overlooked, but now he commands all men everywhere to repent, 31 because he has fixed a day on which he will judge the world in righteousness by a man whom he has appointed, and of this he has given assurance to all men by raising him from the dead." Note from this that "The God who made the world and everything in it" (vs. 24) is also the one who "has fixed a day on which he will judge the world in righteousness BY A MAN whom he has appointed" and whom he has risen from the dead. This "man," of course, is Christ. The one who appointed Jesus and rose Him from the dead is obviously the Father. Thus, the Father is the one who made the world and everything in it. 2 Cor 4:6 For it is the God who said, "Let light shine out of darkness," who has shone in our hearts to give the light of the knowledge of the glory of God in the face of Christ. Note here that "the God" is the one who gave us Christ, meaning that "the God" is a reference to the Father. Thus, it is the Father who said, "Let light shine out of the darkness." Here Paul is quoting Gen 1:3, where "God" created light. This means that it is the Father who created light and, consequently, is responsible for all of the other acts of creation in Gen 1. Eph 3:9-11 "and to make all men see what is the plan of the mystery hidden for ages in God who created all things; 10 that through the church the manifold wisdom of God might now be made known to the principalities and powers in the heavenly places. 11 This was according to the eternal purpose which he has realized in Christ Jesus our Lord,"
Note that the "God who created all things" is the one who has realized His eternal purpose in Christ Jesus our Lord. This means that the "God" in question is the Father. Thus, the Father has created all things. In this passage, the God who gives life to all things is distinct from Christ Jesus, therefore the "God" in question, who gives life to all things, is the Father. Heb 2:10 For it was fitting that he, for whom and by whom all things exist, in bringing many sons to glory, should make the pioneer of their salvation perfect through suffering. The pioneer of our salvation who was made perfect through suffering is the Son. The Father is the one who perfected the Son through suffering. Therefore the Father is the one for whom and by whom all things exist. Rev 5:6-7 And between the throne and the four living creatures and among the elders, I saw a Lamb standing, as though it had been slain, with seven horns and with seven eyes, which are the seven spirits of God sent out into all the earth; 7 and he went and took the scroll from the right hand of him who was seated on the throne. At first, one would think that the figure from Rev 4 who sits on the throne and is accredited by the twenty-four elders with creating all things is Jesus. He is, after all, the King of Kings who sits at the right hand of the Father. But, later on in Rev 5, we read that the Lamb takes the scroll from the hand of him who is seated on the throne. The Lamb is most surely Jesus. This means that the figure on the throne who created all things is the Father. Note that, in affirming the creative work as an act of the Father, I am not implying that the creative work was no longer that of the Son. What I'm really trying to do is affirm the creative work as equally that of the Father, the Son, and the Holy Spirit. This follows logically from what Catholics believe about the Trinity. Each Person of the Trinity possesses fully the one divine nature. This means that each Person possesses all of the prerogatives and powers that come with being divine. One of those actions that is proper to the divine nature is the power to create out of nothing. Thus, each Person of the Trinity -- the Father, the Son, and the Holy Spirit -- possesses the power to create out of nothing. Since the Persons of the Trinity are distinct BUT NOT SEPARATE (otherwise the unity of the One God would be destroyed), what is predicated of one must be predicated of the other two. There is no scenario in which one Person of the Trinity does something, and the other two just sit back and twiddle their thumbs. They, all three, are present together, doing everything and being everything that is God. Thus, if creation is predicated of the Son, it must also be predicated of the Father and the Holy Spirit -- and we see from Scripture that it is. We are already in agreement that the creation of all things is also predicated of the Son. But, it is still helpful to list the passages which show this. Psa 33:6 By the word of the LORD the heavens were made, and all their host by the breath of his mouth. Jn 1:1-3,10 In the beginning was the Word, and the Word was with God, and the Word was God. 2 He was in the beginning with God; 3 all things were made through him, and without him was not anything made that was made. [...] 10 He was in the world, and the world was made through him, yet the world knew him not. Col 1:15-17 He is the image of the invisible God, the first-born of all creation; 16 for in him all things were created, in heaven and on earth, visible and invisible, whether thrones or dominions or principalities or authorities--all things were created through him and for him. 17 He is before all things, and in him all things hold together. Heb 1:2 but in these last days he has spoken to us by a Son, whom he appointed the heir of all things, through whom also he created the world. Heb 11:3 By faith we understand that the world was created by the word of God, so that what is seen was made out of things which do not appear. Rev 3:14 "And to the angel of the church in La-odice'a write: 'The words of the Amen, the faithful and true witness, the beginning of God's creation. It should be seen from this that the Son is duly accredited with the creation of all things. Gen 1:2-3 The earth was without form and void, and darkness was upon the face of the deep; and the Spirit of God was moving over the face of the waters. 3 And God said, "Let there be light"; and there was light. Could it be that it was the Spirit moving over the waters that caused everything to spring into being? This is a mysterious passage that seems to attribute at least some causality to the Spirit. There are other passages in which this becomes more explicit. Psa 104:30 When thou sendest forth thy Spirit, they are created; and thou renewest the face of the ground. 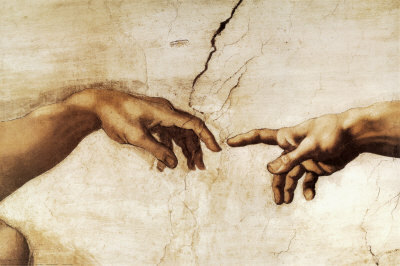 This too is a clear reference to the creation of the Spirit. Gen 1:26-27 Then God said, "Let us make man in our image, after our likeness; and let them have dominion over the fish of the sea, and over the birds of the air, and over the cattle, and over all the earth, and over every creeping thing that creeps upon the earth." 27 So God created man in his own image, in the image of God he created him; male and female he created them. 1 Cor 8:6 yet for us there is one God, the Father, from whom are all things and for whom we exist, and one Lord, Jesus Christ, through whom are all things and through whom we exist. Paul clearly shows us here that all things are equally from both the Father AND the Son. You can find the strangest people on Facebook. I'm a member of this FB group called "Apologetics: Defending the Faith (and Discussion)" (my series of "Facebook Apologetics" posts came from my interactions with that group). One of the members calls himself a Christian but refuses to admit that Jesus is God. Crazy, I know ... but it did give me the opportunity to research something I had always just taken for granted and to find out where it is exactly that Scripture supports the divinity of Christ. This post is what I was able to come up with. Exo 3:13-14 Then Moses said to God, "If I come to the people of Israel and say to them, 'The God of your fathers has sent me to you,' and they ask me, 'What is his name?' what shall I say to them?" 14 God said to Moses, "I AM WHO I AM." And he said, "Say this to the people of Israel, 'I AM has sent me to you.'" By taking upon Himself the Divine Name, Jesus is declaring His divinity. At any rate, how can He exist before Abraham and not be God? If Jesus is not God, then His words here are completely nonsensical. Jesus' words during His Temptation in the desert are also instructive. When Satan tempted Jesus to throw Himself off a cliff, even presuming to quote Scripture so as to make the temptation more persuasive, Jesus responded by saying, "You should not tempt the Lord your God" (Mt 4:7) -- in reference to Himself! Satan was tempting God by tempting Jesus, and Jesus made sure Satan knew it. 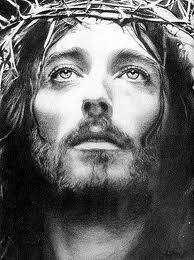 Jesus also called Himself the "Son of God," which, to the Jewish mindset, was a very radical statement. During Jesus' trial before the Jewish leaders, the High Priest said to Jesus, "I adjure you by the living God, tell us if you are the Christ, the Son of God" (Mt 26:63). Jesus responded by saying, "You have said so" (vs. 64), or as the NIV has it, "Yes, it is as you say." The High Priest responded by tearing his robes and saying, "He has uttered blasphemy. Why do we still need witnesses? You have now heard his blasphemy" (vs. 65). Later, before Pontius Pilate, the Jews said, "We have a law, and by that law he ought to die, because he has made himself the Son of God" (Jn 19:7). They knew that to declare oneself to be "the Son of God" was to declare that one was of the same nature with God. The son of a father always takes on the nature of the father. Or, as the Letter to the Hebrews tells us, the Son "reflects the glory of God and bears the very stamp of his nature" (1:3). When Jesus healed the crippled man by the Bethzatha pool, the Jews rebuked Him for healing a man and telling him to carry his pallet on the Sabbath. Jesus responded to them by saying, "My Father is working still, and I am working" (Jn 5:17). Immediately after this, John is sure to tell us, in case we are not convinced, "This was why the Jews sought all the more to kill him, because he not only broke the sabbath but also called God his Father, making himself equal with God" (vs. 18). Jesus, in order to make this more explicit, even says to the Jews, "I and the Father are one" (Jn 10:30). When they heard this, "The Jews took up stones again to stone him" (vs. 31). Jesus answered them, "I have shown you many good works from the Father; for which of these do you stone me?" (vs. 32) The Jews answered him, "It is not for a good work that we stone you but for blasphemy; because you, being a man, make yourself God" (vs. 33). Finally, when John, in his Revelation, saw a vision of "the Son of Man", this figure said to him, "Fear not, I am the first and the last" (Rev 1:17). This Son of Man is equating Himself with "the Lord God, who is and who was and who is to come, the Almighty" who said, "I am the Alpha and the Omega" (vs. 8). And of course, this Son of Man is Jesus, who took this title upon Himself many times throughout His ministry (28 times in Matthew's gospel alone, see here). There are also many passages where the apostles and followers of Christ call Him "God". John began his Gospel with these words: "In the beginning was the Word, and the Word was with God, and the word was God." (Jn 1:1) We know that this "Word" is the Second Person of the Trinity made man -- Jesus Christ -- for John says a few verses later, "And the Word became flesh and dwelt among us, full of grace and truth; we have beheld his glory, glory as of the only Son from the Father" (vs. 14). John also called Jesus "the true God and eternal life" in his first letter (5:20). Peter, for his part, accused the Jews in the Temple of killing "the Author of life" when they asked that Barabbas be released and sent Jesus to be crucified (cf. Acts 3:12-15). And yet, Timothy is clear that it is God who gives life to all things (cf. 1 Tim 6:13). Thus, Jesus cannot be the Author of life unless He is God. Peter specifically called Jesus "our God and Savior" in his second letter (1:1), as did Paul (cf. Titus 2:13). Paul also said of Christ that "in him the whole fullness of deity dwells bodily" (Col 2:9). According to him, Christ is the one, "who, though he was in the form of God, did not count equality with God a thing to be grasped," or, as the Douay-Rheims has it, "thought it not robbery to be equal with God" (Phil 2:6). Heb 1:5-8 For to what angel did God ever say, "Thou art my Son, today I have begotten thee"? Or again, "I will be to him a father, and he shall be to me a son"? 6 And again, when he brings the first-born into the world, he says, "Let all God's angels worship him." 7 Of the angels he says, "Who makes his angels winds, and his servants flames of fire." 8 But of the Son he says, "Thy throne, O God, is forever and ever, the righteous scepter is the scepter of thy kingdom." In this passage, the Father is addressing the Son by saying, "Thy throne, O God, is forever and ever." It is fitting that God Himself would provide the final seal upon the witness to Christ's divinity. When Jesus saved his apostles from the storm by walking on the water and calming the storm by His own power (itself an expression of His divinity), Matthew tells us, "And those in the boat worshiped him, saying, 'Truly you are the Son of God.'" (Mt 14:33). Of the man cured by Jesus of an unclean spirit it is said, "when he saw Jesus from afar, he ran and worshiped him" (Mk 5:6). When Jesus asked the man who he had cured of blindness if he believed in the Son of man, "He said, 'Lord, I believe'; and he worshiped him" (Jn 9:38). After Jesus' death, He continued to be worshiped. When He appeared to Thomas after His resurrection and Thomas was able to actually see and touch the wounds of the Risen Lord, "Thomas answered him, 'My Lord and my God!'" (Jn 20:27-28) When He appeared likewise to His disciples, "they came up and took hold of his feet and worshiped him" (Mt 28:9). Jesus later appeared on a mountain in Galilee and "when they saw him they worshiped him" (vs. 17). When Jesus ascended into heaven, the apostles "worshiped him, and returned to Jerusalem with great joy" (Lk 24:51-52, KJV). Acts 9:10-17 Now there was a disciple at Damascus named Anani'as. The Lord said to him in a vision, "Anani'as." And he said, "Here I am, Lord." 11 And the Lord said to him, "Rise and go to the street called Straight, and inquire in the house of Judas for a man of Tarsus named Saul; for behold, he is praying, 12 and he has seen a man named Anani'as come in and lay his hands on him so that he might regain his sight." 13 But Anani'as answered, "Lord, I have heard from many about this man, how much evil he has done to thy saints at Jerusalem; 14 and here he has authority from the chief priests to bind all who call upon thy name." 15 But the Lord said to him, "Go, for he is a chosen instrument of mine to carry my name before the Gentiles and kings and the sons of Israel; 16 for I will show him how much he must suffer for the sake of my name." 17 So Anani'as departed and entered the house. And laying his hands on him he said, "Brother Saul, the Lord Jesus who appeared to you on the road by which you came, has sent me that you may regain your sight and be filled with the Holy Spirit." Note that it is "the Lord" who told him to go and find Saul (vs. 11), yet when Ananias told Paul what he heard in prayer, he said that it was "the Lord Jesus" who sent him so that Saul might regain his sight and be filled with the Spirit (vs. 17). This can only mean that Ananias spoke with Jesus Himself in prayer. This is both an act of worship and a clear indication that Jesus is God. How else can Jesus be prayed to and be revealed in prayer? Of course, Jesus continues to be worshiped in the Church up to the present day and will be worshiped forever and ever. Hopefully it is clear from all of this that Jesus considered Himself to be God and that the followers of Christ considered Him to be such, as evidenced by their many references to Jesus as God and their acts of prayer and worship towards Him. There is of course much more that could be said in defense of Jesus' divinity. For example, I could list the attributes of God that Jesus possesses, I could list the various miracles He performed (which witness to his divine power), I could analyze the other titles of Christ (such as "Lord," "Savior," "Prince of Peace," etc.) which are a clear witness to His divinity. In the future I may enlarge this post to include those things. But, I think that, for now, this is a good start and is on its own all the evidence one needs in order to prove from Scripture that Jesus is God. "The grace of the Lord Jesus Christ and the love of God and the fellowship of the Holy Spirit be with you all" (2 Cor 13:14). What is the teaching of the Council of Ephesus? It renewed the condemnation of Pelagius, who taught a works-based salvation. If anyone tells you that Catholics believe in salvation by works, tell them that we condemned that heresy almost 1600 years ago! You can read the proceedings of the Council here. After the person in question has been deceased for at least 5 years, then a request can be made to his or her bishop to begin an investigation of the person’s life to discern if he or she is a worthy candidate for canonization. If a Catholic goes to Confession and then dies as he walks out of the confessional, will he go straight to heaven? What is the difference between temporal punishment and other types of punishment?